Trippen has a unique way of manufacturing their shoes. Each of their designs are dependent on the production process, which determines what they can create that will simultaneously counterpoint issues like irresponsible resource use. This is why the majority of their soles are created with rubber, as it allows for the shoe’s continued longevity and durability. Not only this, but the soles of their shoes are sewn into the upper, which means that glue is unnecessary and allows for worn soles to be removed and recycled later. Trippen offers over 2000 models available in 30 different materials and colors, and many of these can be customized to fit anyone’s aesthetic. 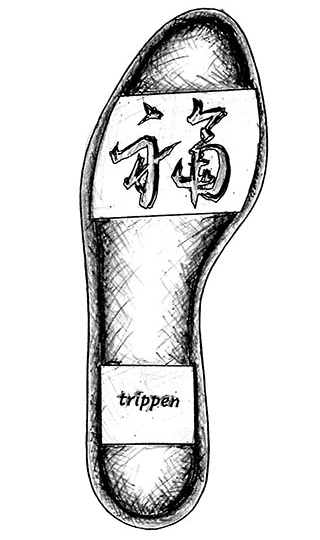 Their website boasts an entire “Made For You” section, which houses Trippen’s entire style history. Any of these shoes can be customized to your liking, in every aspect from the color and treatment of the leather, to the color of the sole. In addition to the iconic silhouettes on the upper portion of the shoe, Trippen has designed a variety of soles that are perfect for every personality. Each sole is not only created to be a work of art, but to be functional as well. 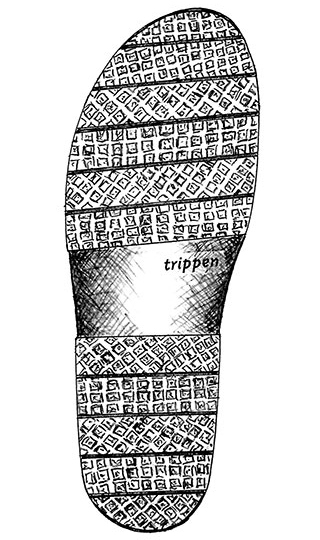 Here’s a look at the variety of Trippen shoes we offer and ideas on how to style them. Designed in 2012, the Splitt wedge sole is approximately 2.5” in height. The Splitt sole was conceived as a sporty, winter alternative to some of their previous collections. It is made entirely from rubber, as most of their soles are. 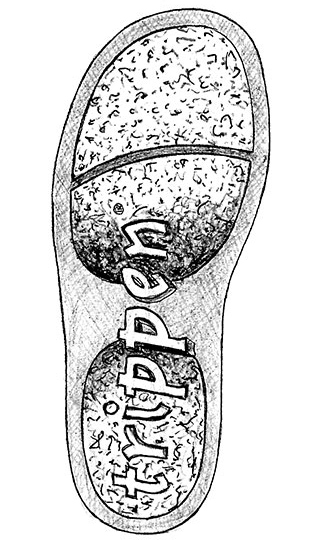 The portion of the heel that rests on the ground is grained for optimal grip. As we transition into the colder days of winter, it can be difficult to want to add a little flair to your wardrobe. Footwear is always a great way to start and we suggest pairing our Trippen Blaze Bootie with an Avant Toi sweater and Alonpi scarf, while topping the outfit off with a great Moussy jean. 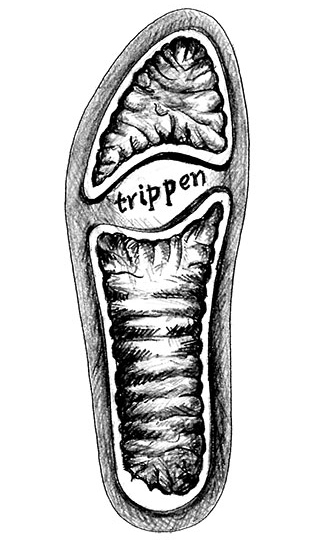 Trippen’s Happy sole is a platform that’s around 2.75” in height, and was created in 2008. The internal construction is specially designed to stabilize the foot while it is perched on the platforms. This sole contains well positioned air chambers that help reduce the weight, and absorb shock when walking. 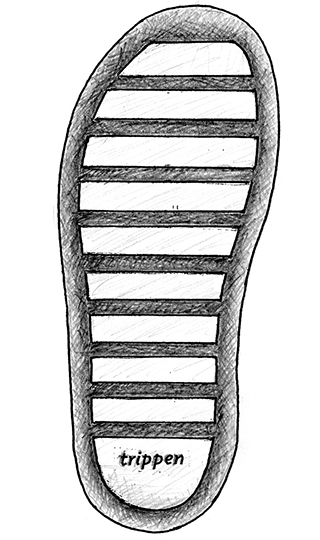 The Happy sole was designed to function with an appeal similar to high heels. Although heels in themselves are often associated with more classically feminine styles, they can also be worn in a way that becomes edgy. The Rundholz Quilted Jacket can be worn with a skinny jean and the Trippen Rotate Shoe, resulting in a look that is perfect for those who want to maintain some aspects of femininity without it being overwhelming. Trippen’s Katmandu sole is ideal for winter styles. As far as care goes, because this is a winter style it requires just a bit more attention. The edges of the sole and the upper of the shoes should be treated with suitable shoe polish on a weekly basis to prevent moisture from seeping in. The Katmandu sole remains styled best with other winter items. Trippen’s Mexico Boot can be worn with a cozy Hania sweater, our striped Uma Wang scarf, and a good pair of jeans. 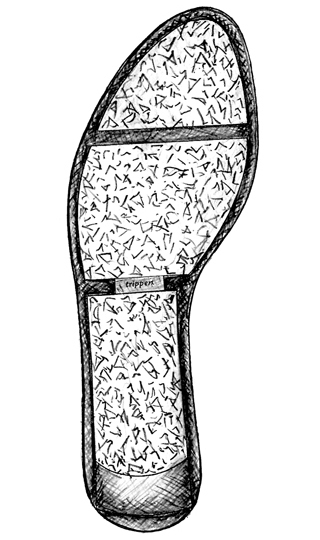 The Sport sole is a development of the original Box sole. These soles contain a raised base, allowing the shoe to be worn without worry of moisture seeping into the leather. A full grain leather insole stabilizes the shoe and offers an excellent fit, while the sole’s ridged base provides stable grip. Antiann creates work that is perfect for those who want an edgy take on femininity. These Trippen Subway Booties compliment that aesthetic perfectly, and can be worn with an Anntian Circle Top and Closed jeans. The Stick sole is only available in specific styles. Because the sole itself is made up of multiple parallel bars, this is by far the most flexible sole Trippen offers. The shoe is free to bend as much as needed to provide a comfortable walking experience thanks to its construction. Oddly enough, even classic styles can benefit from simplistic footwear. White button up shirts and jeans can lend themselves to more sophisticated styles when paired with an oxford or a similar shoe. However, for a casual outfit you can easily wear Labo.art’s Monaco Sushi Shirt, with Closed Baker Jeans in Mid Blue and a pair of Trippen Drift Sandals. The Penna sole is nearly as flexible as the Stick sole. Trippen designed the Penna in 2003, with the goal of combining comfort and function in a way that allowed them to facilitate a simplified manufacturing process. The concave design allows shock absorption, and is made entirely of rubber. Gilda Midani is often paired with a sneaker or a sandal, depending on the context, as this brand emits a more casual aesthetic. This Trippen Iris sandal can be worn with a Gilda Midani super tee, and white AG Jeans.